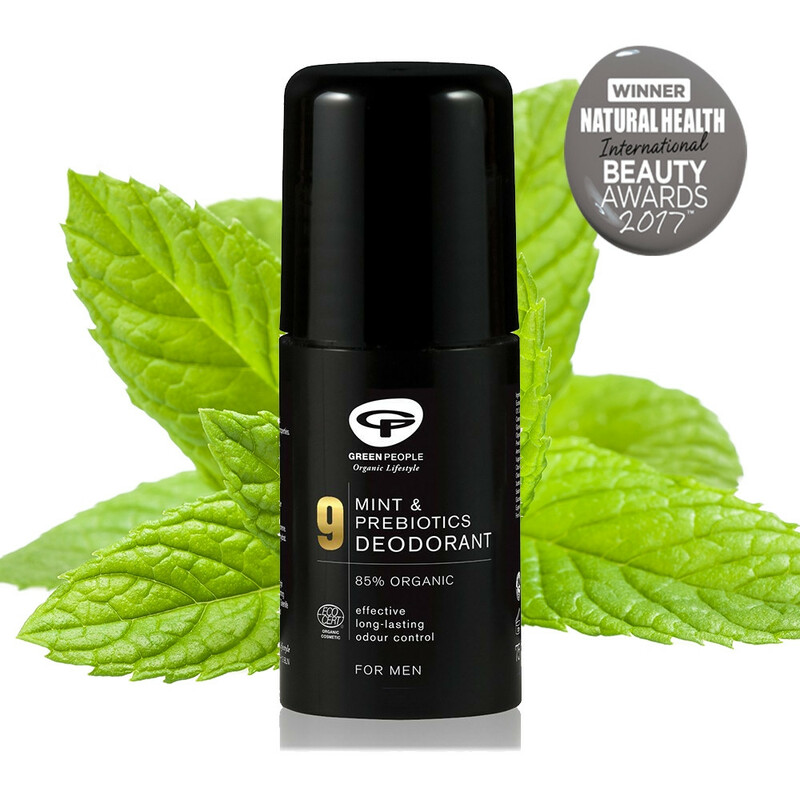 Minty roll-on men's deodorant for all skin types. Ingredients: AQUA (SPRING WATER), POTASSIUM ALUM (NATURAL MINERAL), OLEA EUROPAEA (OLIVE) FRUIT OIL*^, HELIANTHUS ANNUUS (SUNFLOWER) SEED OIL*, ZINC RICINOLEATE (FROM CASTOR OIL), CETEARYL GLUCOSIDE (PLANT DERIVED EMULSIFIER), CETEARYL ALCOHOL (EMULSIFYING PLANT WAX), BUTYROSPERMUM PARKII (SHEA) BUTTER*^, GLYCERYL STEARATE (PLANT DERIVED EMULSIFIER), LEVULINIC ACID (PLANT DERIVED), ALPHA-GLUCAN OLIGOSACCHARIDE (PREBIOTIC), ALOE BARBADENSIS (ALOE VERA) LEAF JUICE POWDER*, ROSMARINUS OFFICINALIS (ROSEMARY) LEAF EXTRACT*, AROMA [MENTHA PIPERITA (PEPPERMINT) OIL*^, LAVANDULA ANGUSTIFOLIA (LAVENDER) HERB OIL*^, EUCALYPTUS GLOBULUS (EUCALYPTUS) LEAF OIL*^], CETEARYL OLIVATE (FROM OLIVE OIL), SORBITAN OLIVATE (FROM OLIVE OIL), SCLEROTIUM GUM (NATURAL GUM), XANTHAN GUM (CORN STARCH GUM), SODIUM STEAROYL GLUTAMATE (PLANT DERIVED EMULSIFIER), SODIUM LAURYL GLUCOSE CARBOXYLATE (PLANT DERIVED), LAURYL GLUCOSIDE (PLANT DERIVED), POTASSIUM SORBATE, CITRIC ACID, LIMONENE, LINALOOL. *INGREDIENTS FROM ORGANIC FARMING. ^FAIRLY TRADED ECOCERT 99.7% NATURAL INGREDIENTS; 85.7% ORGANIC INGREDIENTS.